The orders are in and the wait is over. Next stop for the Rubesh Caravan? Prague, the capital of the Czech Republic! Known as the "city of a hundred spires" and the "golden city", Prague is home to approximately 1.2 million people. Well, make that 1,200,005 come middle of August, when we're expected to arrive! Kevin will be taking up the position of Information Management Officer at the US Embassy in Prague, taking care of the Embassy's communications needs. Erin will continue to lead a "life of leisure." Well... as much leisure as a full time Mom of three kids can include, at least! We're taking bookings for visitors, starting in the fall (give us a couple months to set up house, OK? ), so plan on swinging on by as part of your European Vacation! Up for an adrenaline rush? Via Ferratta (Italian for the Iron Way) is a mountain route which is equipped with fixed cables, stemples, ladders, and bridges. Kevin joined a group of equally wacky adventurers to try it out. This one, hugging the cliffs and crossing far above the floor of the Snake Gorge in Oman is a great spot for some fantastic scenery and great fun. 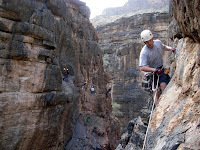 Check out all the photos at http://picasaweb.google.com/kevin.rubesh/ViaFerrata. The Rubesh "Web Site Thingie" is going hi-tech! With the addition of a Blog (WebLog) to our website, we'll be able to post updates and photos more often, and you'll be able to leave your comments and notes right along with our posts! Let the fun begin!